On June 11, CPD launched its newest initiative, Creating Action Movement and Power, better known as CPD CAMP. Held this year in Washington, DC, CPD CAMP brought together 40 CPD affiliates from across 26 states and Puerto Rico for a week-long, multi-track training program. CPD CAMP provided 125 executive leaders, organizers, communicators, politics and development staffers with opportunities to grow as leaders, strengthen their organizations, and enhance our ability to create change as a movement. Created in collaboration with CPD Network leaders, CPD CAMP consisted of six tracks focused on New Organizers, Lead Organizers, Development and Fundraising, Politics, Communications, and Emerging Leaders. The convening was grounded in a framework we refer to as the 4Ms - Members, Model, Movement, and Money. Our organizing and capacity building philosophy points to these elements as vital stats that cultivate successful and complete organizations. Each track ensured participants gained hard skills to expand their base of directly-impacted members, allies, and supporters (members), strengthen their organizations and/or deepen their organizing work (model), advance campaigns that maximize movement-building opportunities (movement), and position their organizations to generate financial resources and support (money). Participants explored a wide variety of topics from sustainable fundraising to using research and data to drive strategic campaigns to learning how to pitch reporters and have a strong social media presence, and to peer-to-peer coaching and leadership development across affiliate organizations. As an example, the Emerging Leaders track was incredibly meaningful to attendees. This program specifically focused on investing in the leadership and capacity of the CPD Network in order to build grassroots, people’s institutions grounded in scalable and visionary community organizing practices. 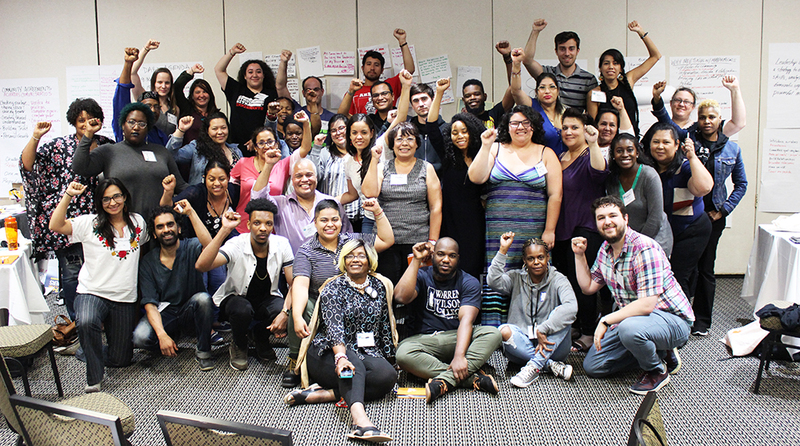 Eighteen leaders from sixteen CPD affiliates -- most of whom identified as women and people of color -- gathered to explore their personal leadership styles, clarify their visions, and collectively articulate a theory for how to build a powerful grassroots movement. Leaders in attendance deeply valued the thought partnership, camaraderie, and space for reflection. Participants headed back to their communities energized, grounded and ready to lead boldly and authentically. CPD CAMP generated stronger bonds and fueled the collective responsibility of our network to continue fighting for our communities. This inaugural convening enables the CPD Network to ground itself in a universally applicable approach to building powerful and sustainable people’s organizations that are centered in the values held and the lived experiences of our affiliates. CPD CAMP provided a space for participants to deepen their personal leadership while building strategic and tactical capacity to strengthen our growing network of resilient people’s organizations, moving our communities beyond this political moment towards a more progressive reality. This important work allows us to catalyze and support the upsurge of resistance energy and activity, to protect vital victories of the past, to win new progressive change, and to elevate our collective voice and vision for justice. Without your support, this work is not possible. Please help us continue to mobilize and empower communities most impacted by injustice and inequality by making a donation today.